SIM card files recovery software securely recovers all deleted, erased short text messages (SMS) and phone book contact numbers from the sim card of the most commonly used mobile cell phone. Recovery software reads and examines SIM Card of any mobile phone with the help of USB sim card reader hardware device (a phoenix type USB sim card reader or PC/SC Standards based sim card maker) and recovers deleted information quickly and effectively. The software is very useful when you have deleted your favorite text messages (inbox outbox, send items SMS) or other important contact numbers by accidentally pressing the delete button from the mobile phones and wonders how to recover back. Our software takes a minute time to restore all deleted text messages on Windows operating system. Generate detailed information report in txt format which makes possible viewing date and sending time of deleted text messages along with detailed contact details. Show all phone book contact details along with the contact name and number. Recovers all deleted SMS (Short Message Service) in minute time. Support SIM card of any service network provider. Read SIM card of any country situated at any location in the world. View ICC identification number printed on your SIM card along with service name provider. 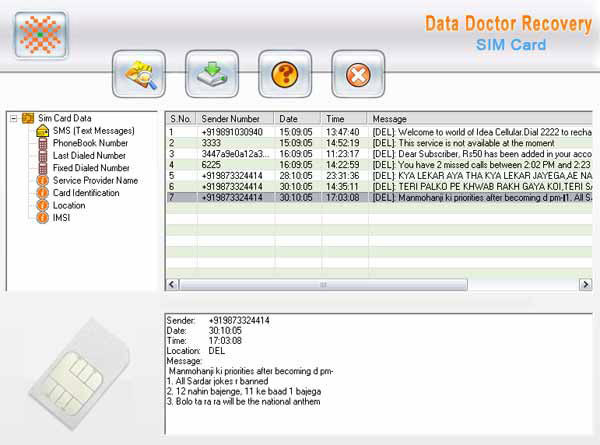 The software supports SIM card of any mobile operator network service provider whether number in subscription status or not. Easy and safe to use and does not require any prior technical skills to operate the software. Download the FREE demo of Sim card files recovery software from the link given below to fully understand the software functionality. Upon satisfying you can order for the full version.